Samaritan is proud to host the Art of Healing exhibit, featuring the work of local artists who want to provide a calming presence and healing environment for Samaritan patients, families, staff, and guests. We invite you to enjoy the beautiful artwork of the following artists currently on display from April 2019 to Fall 2019. If you’re interested in purchasing artwork, please reach out directly to the artist. A portion of all proceeds — 20% — benefit Samaritan patients and their families. Scroll down to read artist bios and statements. “Gardens of Hope” are made with watercolors to which I add painted textured papers to make the flowers come alive. “Gardens of Hope” are made with watercolors to which I add painted textured papers to make the flowers come alive. 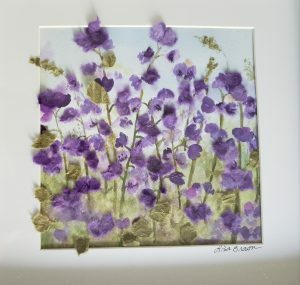 Through exploration and experimentation I found a lively frolicsome expression of nature in which I combine a variety of media starting with a dynamic watercolor painting or an acrylic background and then overlapping it with flowers and a foreground made with textured papers. To that I add beads, leaves, gauze, hand-made papers and paint assembling the work piece by piece and layer by layer into a dazzling finished work of art. I often have a theme or subject in mind yet as the composition is continually changing, I am refining the piece as I work so that each is unique expression of my love of nature. I am a teacher as well as a fine artist and often discover while teaching or preparing for workshops. 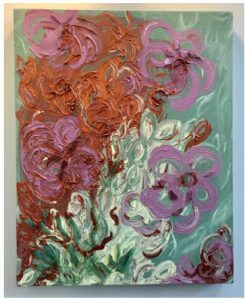 My “art-as-therapy” programs are geared to those suffering adversity or pain, working through the rough times and enhancing their lives by directing them through the process of creating. I am part of an alliance starting up in the NJ area concentrating on bringing the arts into hospital or health centers. In making my art as I do, the art process envelops me and I lose track of time while my mind is concentrating on the task at hand. I use both hands and thus both sides of my brain bringing my creative imagination together with my expertise in art media. This is the freedom and release I bring to my students. 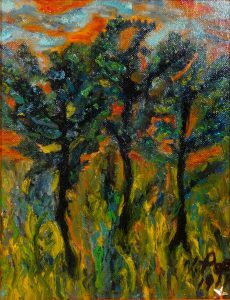 To learn more about my process, see more samples of my work, or learn about the workshops available, please visit my website: art-as-therapy.com. 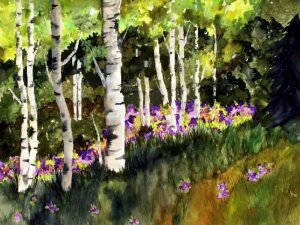 Suzanne Morgan is an artist, photographer and filmmaker working with traditional materials that include acrylics, oils and pastels as well as glass, hardware store finds, garage sale treasures and 4- legged models. Her works range from the two dimensional abstracts and sculptures in miniature to full room installations and explore unique views of inanimate objects and equines in order to inject humor and tap into the viewer’s memory to open up unimagined possibilities. Her paintings, mosaics, installations, and photographs continually draw out the potential of the mediums she works with, from paint and fabric or glass and wood, to a stranger’s discarded treasures like rusted spurs, satin table linens or chandelier crystals and toy cars. Morgan earned three Emmys and four Gracie Allen Awards during her 15 years at NFL Films before changing her creative course to focus on the visual arts, becoming a lead scenic artist, arts educator and collaborator on community projects, including over 10 large scale glass mosaic murals with middle school students installed in Medford Township Schools. She has a BA from Duke University and is currently pursuing her Masters in Fine Art at the Pennsylvania Academy of Fine Arts in Philadelphia. My mind is flooded constantly with ideas about color and shapes, reflections and shadows and how they allow me to play with everyday objects, and an endless variety of materials to manipulate from art supply, hardware, and antique stores. Whether making traditional fine art, films, mosaics or set pieces, I often dive right in, curious to see what is possible with paint and fabric, glass and wood, or a stranger’s discarded treasures. Along with seeking to present a unique vision of inanimate subjects, I also eagerly explore the animal world, particularly that of horses, through photography, sculpture and installations and am currently exploring how this fragile beast’s evolutionary ride has been inextricably tied to man’s. I aim to make a visual impact whether through traditional fine art, new media like Instagram or live performance and capitalize on as many of the imaginative seeds in my brain that erupt like weeds in my carefully tended garden of daily life. My intention is to uncover spirit and beauty in my work, as well as tackle exploration, creation and disruption by pushing materials, ideas and subjects together in non-traditional ways. I also aim to further thought, inject humor and tap into the viewer’s memory, asking them to revisit the objects and animals they think they know and open their eyes to untold and unimagined possibilities. Vandella Poe is a New Jersey born artist, presently living in Beverly, NJ. 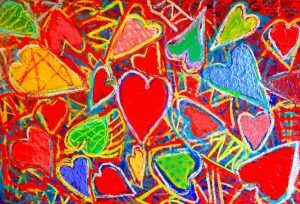 Her pieces include paintings, pastels, drawings, and mixed media works are visually stunning and colorful. Whether she is paining a landscape, a grouping of trees, or a portrait, Poe’s creative use of color immediately catches the eye. Her art represents more than just a pretty picture. Her thoughts and feelings on betrayal, fear, homelessness, the loss of loved ones, and loneliness, and nature have all been expressed in her work. The first recollection of her having any artistic capabilities was in the sixth grade. The teacher was looking for students who could paint or draw, someone who could do a mural about Thanksgiving. A classmate volunteered her services. Afterwards, the principal called her mother in for a conference about putting her in an art school. Poe’s response was, “don’t you know artist starve.” She spend 16 years paining, learning, and studying different theories and techniques of painting under the tutelage of artist John Kevin Loesch. Artists and painters admired are Jackson Pollock, Paul Gauguin, Vincent Van Gogh, Bonnard, Harry Bernard, Edward Munch, Jacob Lawrence, Jean-Michel Basquiat and Howardena Pindell. As far as her art goes, Poe says she will continue to challenge her creativity on a large scale, experimenting with all kinds of medium, combining different textures, mastering and creating art on a higher plane. Her mind is full of explosive ideas just aching to be expressed. Hopefully, in the future the art she creates will continue to be seen in galleries and visually enjoyed by others. Poe is currently publishing a book called “It’s Not Easy Being Ordinary,” a collection of quirky essays, poems, quotes, letters to a lover, and extraordinary art by an ordinary person. I refer to my work as abstract expressionism. My choice of media ranges from pastels to oils to acrylics. I often incorporate items such as cardboard, photos, tiles, paper, wood, screws, furniture, or anything that I find interesting and reusable when creating my art. What some consider trash, I see as potential for creativity. I prefer to use my hands when created art. This allows me to interact with the textures of each and every aspect of the media being used. Some of the concepts of my work are taken from nature, but mainly it is mentally based on my emotions about family, hurt, love, sadness, loneliness, happiness, fear, and my imagination. The ability to manifest what is in my mind to something that is significant and tangible is what abstract self expression allows me to do. To express something deep within myself for others to observe, perhaps invoking an emotion or thought, or feeling they never encountered, or knew existed. Tremain Smith has four works in the permanent collection of the Metropolitan Museum of Art in New York. Her work is in corporate and private collections across the country. 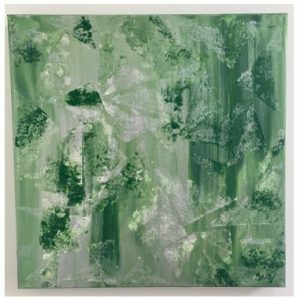 She has had dozens of solo exhibitions in New York, Los Angeles, Chicago, Atlanta, Philadelphia, Scottsdale, Maine, Delaware, Florida and Hawaii. 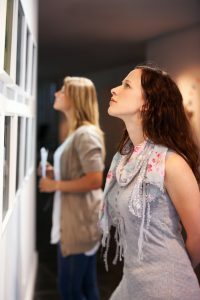 Group exhibitions include SOFA Chicago, Art Miami, the Painted Bride, the Philadelphia Art Alliance, and the USArtists American Fine Art Show. Smith has been reviewed extensively including coverage by the Philadelphia Inquirer, the Chicago Tribune and the LA Weekly. Her work is included in Encaustic Art in the Twenty-First Century by Anne Lee & E. Ashley Rooney published by Schiffer Publishing, The Art of Encaustic Painting Contemporary Expression in the Ancient Medium of Pigmented Wax published by Watson-Guptill, and in the art journal New American Paintings. Smith studied at the Pennsylvania Academy of Fine Arts, Tyler School of Art, Carnegie-Mellon University and the University of Pennsylvania. She received a Teaching Artist Certificate from the University of the Arts in 2009. Alongside her studio practice, Tremain teaches, lectures, and leads workshops. She was a panelist at the Eighth International Encaustic Conference presenting on “The Roots of Contemporary Encaustic”. Her artistic concerns center on portraying physical and spiritual beauty through the elements of painting. The lines, shapes and colors are mappings of the unseen world. 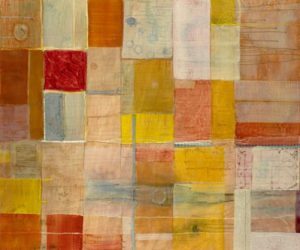 The technique she uses is composed of layers of oil glazes, collaged elements, and transparent beeswax. My artistic concerns center on portraying physical and spiritual beauty through the elements of painting. The lines, shapes and colors are mappings of the unseen as I visually explore internal landscapes. “If you live by inspiration then you do what comes to you.” This quote from artist Agnes Martin has guided me as a painter my entire career. I let the process take over, guiding and absorbing me. I take risks by expressing emotion and freedom in mark-making while simultaneously finding wisdom in structure and restraint. Both convey my concern for expressing exploration and discovery through the language of painting. 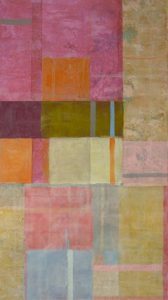 The technique I use is composed of layers of oil glazes, collage, and transparent beeswax on panel. Recent works on paper are made with hand-ground gum Arabic and oil emulsion.